We get asked a lot, “Does mold smell?” Generally, musty odors can be an indicator of mold growth. However, mold is not always accompanied by an odor. It really all depends on the specific moisture conditions and mold conditions in your South Jersey property. Does Mold Smell? Will I Be Able To Smell A Mold Problem In My NJ Home? A musty odor is one of the telltale signs of an underlying mold problem. In some cases, this might be the only sign if the mold growth is hidden behind building materials or in an area that is difficult to access. However, not all mold will be accompanied by an odor. Just because there is no odor, does not mean that you don’t have a mold problem. Mold can be tricky to identify. New Jersey home and property owners should familiarize themselves with the warning signs of a potential mold problem. General wetness– damp building materials, wood rot, etc. We usually hear clients explain it as, “it just smells damp and musty.” This odor is similar to the smell on damp clothes that have been left in the washer for just a little too long. This odor is primarily associated withe the moisture that can cause and support mold growth, not necessarily the mold itself. A mixture of gaseous compounds being released by the mold organism itself– The gaseous compounds are called Microbial Volatile Organic Compounds (MVOCs). MVOCs are a mixture of various compounds (chemicals) that are being released by the mold organism as it eats, grows, and multiplies. Mold odors can permeate beyond the contaminated area. Often times, when New Jersey homeowners detect an odor in a space, the mold is actually originating from a different area. For example, crawl space mold can go unnoticed for a long time, until the odors begin to spread to the upper levels and become noticeable to the residents. If you are detecting an unexplained odors in your NJ home that is seemingly without a source, you could have a hidden mold problem. A trained and certified mold inspector in New Jersey will have the skills, tools and experience to thorough assess your South Jersey home and get to the bottom of the possible mold that could be causing the odor. What Does Mold Smell Like? Is Mold Odor Dangerous? Mold’s scent is generally described as unpleasant, pungent, musty, earthy or even meaty. It can smell like wet clothes that got left is the washer for too long, rotting wood or paper, or even how it smells outside following a rain storm. However, depending on the particular mold contamination and the specific conditions of the affected space, odors can vary per situation. Different MVOCs will give off slightly different odors. Bottom line, if you detect an unexplained odor, you might want to hire a professional to investigate. It is difficult to say for certain if mold odors are harmful to you and your family. Depending on what is causing the odor, there could be potential health effects to some individuals. If the odor is just from the dampness, that should not have much impact on you and your family’s health. However, if the odor is the result of gaseous compounds released from the mold organism, this could mean potential health implications for those exposed to the airborne particles. It is important to keep in mind that everyone reacts to mold exposure very differently. Some individuals might be especially sensitive to mold, while others may not be affected at all. If musty odors have guided you to the discovery of a mold problem in your South Jersey home, you are likely in need of mold remediation services in New Jersey. 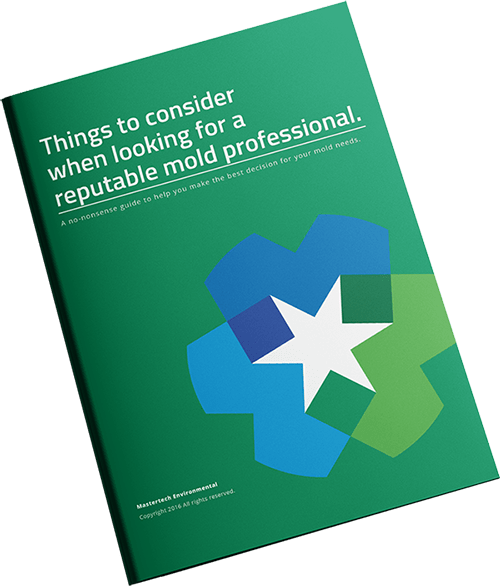 If you are still uncertain whether or not you have a mold problem, or if you suspect a mold problem, but do not know where it might be or how bad it could be, you need to contact a mold inspector in your South Jersey area. A mold inspector will conduct a thorough visual assessment with moisture mapping and thermal imaging to look for signs of mold and signs of conditions that could cause and support mold growth. Additionally, your mold inspector will conduct indoor mold testing to determine if you have elevated indoor levels of mold growth. If a mold inspector confirms an abnormal fungal ecology, your inspector will be able to provide you with an appropriate scope of work for mold removal to address the issue and restore a clean and safe environment.